You likely know that smoking is the top risk factor for lung cancer. But did you know that you can still develop lung cancer without ever touching a cigarette? Factors including secondhand smoke, exposure to radon, naturally occurring gases, asbestos, and exhaust fumes are also known to cause lung cancer. Encounters with these environmental elements can also increase your odds of developing lung cancer. With so many potential triggers surrounding you, being aware of the early signs of lung cancer is vital. Identifying cancer in its early stages is your key to a better chance of surviving the disease. In its initial stages, lung cancer is often a subtle foe. Many people with lung cancer will be asymptomatic at first. However, as the American Cancer Society¹ points out, some indicators are red flags. If you’re concerned about lung cancer, you need to be aware of these signs. Recognizing them and bringing them to your doctor’s attention promptly can lead to an earlier diagnosis and a better prognosis. A Chronic Cough: Viral infections and allergies can trigger an irritating cough that lasts for a few weeks. However, if a cough persists, it’s time to speak with your doctor about a cancer screening. A Cough that Changes: If you’ve had a cough for a while but you’re noticing that it’s changed, it’s time to make an appointment with a healthcare professional. Coughs that produce bloody phlegm, are more frequent, seem deeper, or become painful are a warning sign you shouldn’t ignore. Breathing Changes: If everyday tasks are suddenly leaving you out of breath or breathing becomes painful, it’s a cause for concern. Shortness of breath can be the result of a tumor that blocks an airway or triggers a buildup of fluid in the lungs. Frequent Lung Infections: Are you struggling to shake a stubborn case of pneumonia or bronchitis? Are lung infections a frequent issue for you? 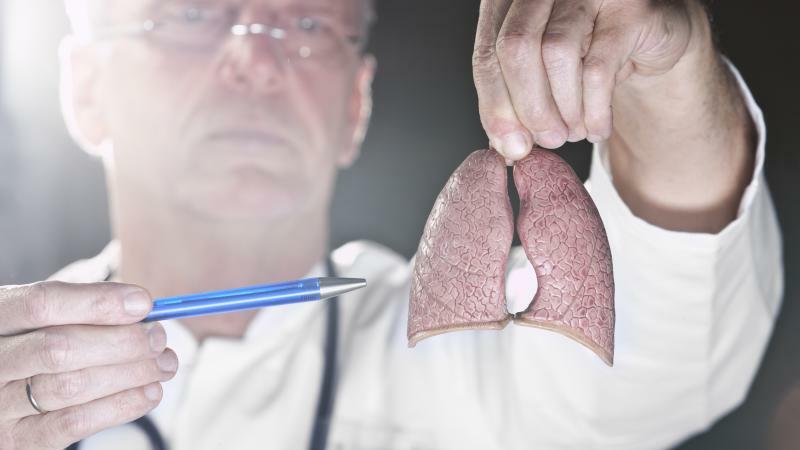 Persistent problems with your lungs may be a sign cancerous cells are lurking there. Chest Pain: Pain in the chest, back, or shoulders may signal the presence of lung cancer. This is especially true if laughing, coughing or taking a deep breath makes the pain worse. Unexplained Weight Loss: Cancer cells use energy, so their presence can change the way your body burns calories and impact your weight. If you drop 10 pounds or more for no apparent reason, then your body may be warning you of a problem. Surgery: Doctors surgically remove the cancerous tissue. This may involve the removal of all or part of a lung. Chemotherapy: Whether via pill or intravenously, chemo medications are designed to kill cancer cells. Chemotherapy tends to involve several rounds of therapy over a period of weeks. Radiation: During a series of treatments, the tumor is blasted with high-energy rays that kill cancer cells. Radiofrequency ablation: After inserting a thin needle into the chest cavity until it touches the tumor, doctors use an electric current to generate heat and destroy the cancer cells. Targeted therapies: Targeted therapies use one or more medications that take aim at specific parts of cancer cells or tumors. Cancer is an enemy you can’t afford to underestimate. Fortunately, doctors are continually working to expand their understanding of this terrible disease and develop and refine treatments for beating it. New advancements continually offer new hope and new possibilities for those battling lung cancer. If you’re experiencing symptoms that might indicate the presence of lung cancer in its early stages, don’t wait. Get checked out immediately – the sooner you get a diagnosis, the sooner you and your doctor can put together a treatment plan. Talking with your doctor about your concerns, getting the proper diagnosis and fully exploring your treatment options can increase your odds of beating this potentially deadly disease. If you’re interested in learning more about lung cancer, start a search today.